8/2012: The Biddle Mansion has a new owner! The purchaser is interested in restoring the property, continuing its use as rental units. Preservation NJ is encouraged by the new owner’s expressed commitment to the property and its historic integrity. 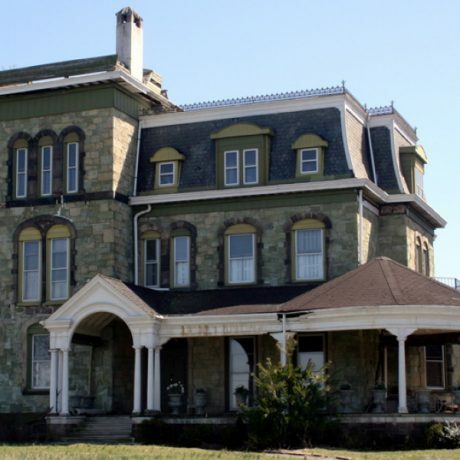 The Second Empire-style Biddle Mansion was built circa 1876 for Charles Miller Biddle, son of one of Riverton’s founders, Robert Biddle, an owner of the Supplee-Biddle Hardware Company in Philadelphia. It was made of Pennsylvania’s uniquely-green serpentine stone; its first-floor ballroom was built with oak from Germany’s Black Forest. Riverton was founded in the 1850s when 10 substantial Philadelphia merchants purchased 120 acres of riverfront land. The group commissioned well-known architect Samuel Sloan to design a summer community. Sloan laid out the streets, buildings, and fences in an irregular manner that was distinct from the grid pattern of Philadelphia and retained a sense of open space. The Biddle Mansion was divided into apartments in 1962 and has been poorly maintained for years. Greenstone is falling from the facade and there are large holes in the front porch. One balcony is missing and the wrought iron trim on another was replaced insensitively. A convex mansard tower, which burned in 1978, was not replaced, and the beautiful riverbank is trash strewn and deteriorating. The building’s fate seems to be demolition: either by continuing neglect on the part of the current owner or by sale to someone who wants to build along a restored waterfront. The building’s current state of decrepitude conceals neither the former magnificence of the villa nor the grandeur of its setting. The wide porch with a graceful arched entrance and the rounded veranda with a conical roof are reminders of the earlier elegance of this mansion. Similar to many other New Jersey municipalities, Riverton’s zoning law does not protect significant historic resources. With a stronger local historic preservation ordinance, Riverton could review proposed projects and make decisions that might maintain the historical character of this community.